'Warms for Moms' delivers mystery, surprise, and the emotion of a personal video message - via a curious wood box in the mail. Your mom's a special woman and she deserves a special gift for Mother's Day. Warm Ventures Inc. has just launched "Warms for Moms", a project to create and produce a more fun, more interesting, and more original Mother's Day gift. 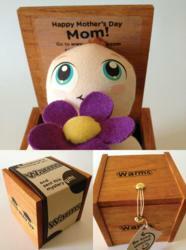 Warms are curious wooden boxes and greeting cards delivered by post or courier. Each one leads to a heartwarming personalized video message and optional e-gift from the giver. "Moms are special women," says co-founder Steve Hardy, "and they deserve a special gift for Mother's Day. We're not saying flowers or an email aren't nice but they're, well, kinda boring, predictable, and forgettable. We're creating something remarkable." 1. Mom receives a package in the mail (yes, old-fashioned post) in the days leading up to May 13th. 2. Intrigued, she finds inside it a small wooden box with a wrap that says "Someone's thinking of you and sent this mystery gift!". 3. Upon unwinding the string clasp and opening the box lid a cute plush character pleasantly emerges wishing her "Happy Mother's Day". 4. There's a unique code and a URL under the box lid. Entered in a web or mobile browser the code reveals a heartwarming, personalized video of the giver (perhaps with their siblings or children) telling mom how wonderful she is. It's an amazing gift experience that mom will talk about for months and remember forever. Says Hardy: "Warms was inspired by my mother and the search for something special and cheerful to send her during her bout with breast cancer. She loved opening her Warms, and the feedback from other recipients at Christmas and Valentine's Day has also been incredibly positive. It's a different type of gift option that we'd like for others to have too." For video and photos, and to pledge a pre-order, go to http://kck.st/z4gvEq. There are two box models - flower and heart - each priced at $30 ($25 for earlybirds) and three card designs for $5 each. Plan ahead this year and send mom something different and fun for Mother's Day. Join the Warms for Moms campaign - pledge now (before April 7th) at Kickstarter to send her a smile! Founded in 2011 with the mission to spread smiles, Warms is a platform that bridges the surprise and substance delivered by physical gift products with the emotion and versatility offered by digital videos and e-gifts. Find Warms online at http://www.givewarms.com, as well as on Twitter (@tWarms), Facebook, and Pinterest.